Fundamental to our culinary ethos is our extended team of Skye producers, growers, farmers, crofters, foragers, fishermen and divers. Most of our ingredients are sourced from within a few miles of the restaurant, followed by the Scottish Highlands and Islands, plus some wider sources throughout Scotland and the UK. The freshness and integrity of our ingredients is a hallmark of what we create. Many local food suppliers reflect our food philosophy by producing their exceptional ingredients and delivering them direct to our kitchen door. The collaborations we've undertaken over many years have helped our partners to develop their own small businesses. This gives us a great sense of pride within our rural community. 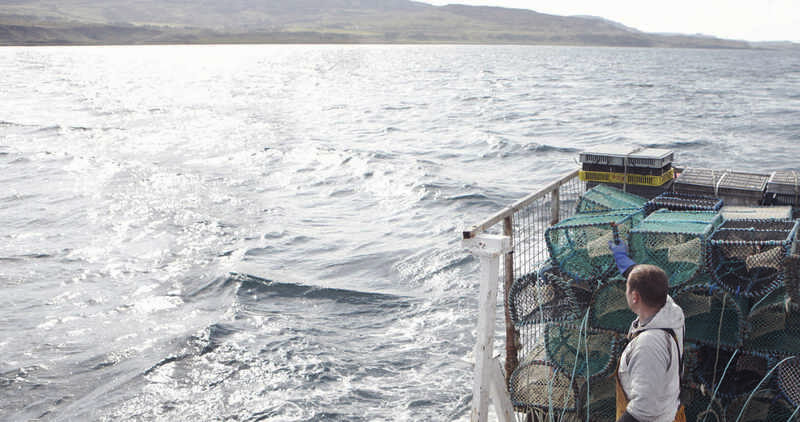 Our local fisherman operate two boats, the Sealgair and the Myamber all the way along the north Skye coast from the Macleod’s Maidens up to the Ascrib islands. 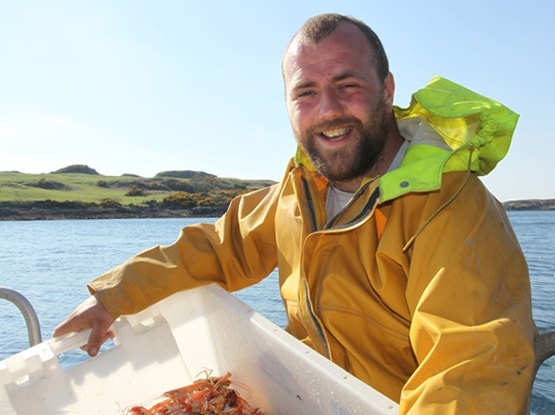 On a good day they land a bountiful catch of lobster, crab and langoustines which Chef Scott Davies collects from the harbour just minutes after they have landed. Rachel and Keith Jackson’s land is mainly rough hill ground, and they have slowly re-balanced the farm’s eco-system through the managed grazing of native breed animals such as Soay lamb, Wild venison and Iron Age pigs. All of which, along with their Orbost Beef are now regularly on The Three Chimneys Menus. 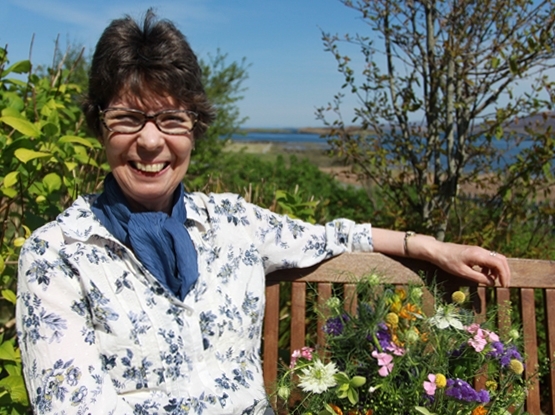 After many years of working on flowers for exhibitions and weddings, Janet Irvine-Smith retired to Skye and then realised a long held dream of opening a flower shop in Broadford. She now has the opportunity of sharing the joy and emotion flowers can bring, and refreshes our vases in the Three Chimneys Restaurant and The House Over-By every week. Cairn O’ Mohr was founded by Ron and Judith Gillies. 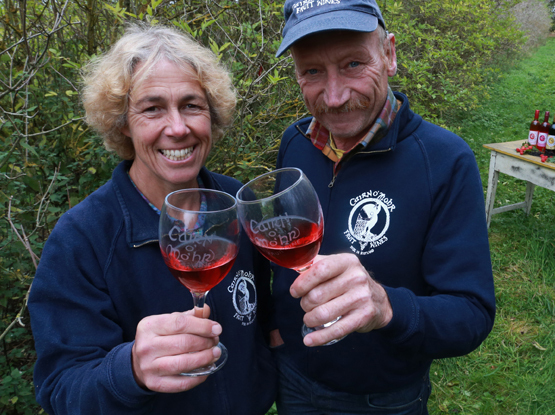 From their orchards in The Carse of Gowrie, Perthshire they cultivate a delicious range of soft fruits and berries to produce Fruit Wines, Ciders and Sparklers. Their wines are used extensively in our Kitchen for stock and sauce preparation but also served as popular aperitifs and on our wine selections. 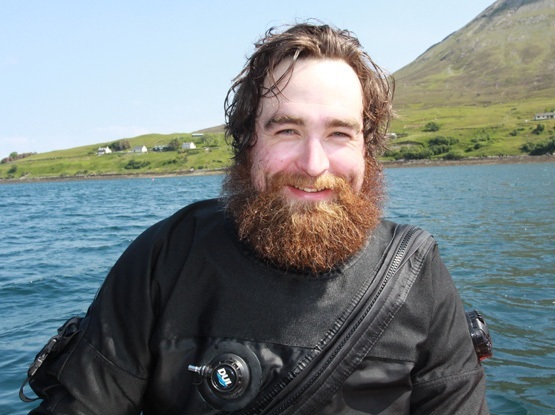 David Oakes began his diving career on adrenaline fuelled adventures in underwater caves. His son Ben grew up working the boats with his father. Their first love has always been farming the sea and they have spent thirty years cultivating the scallop species Pecten maximus. The scallops arrive at our kitchen door, live in their shells, on the day of harvest and the chefs immediately get stuck into expert preparation. Based in the port of Mallaig on the Road to the Isles, Andy Race Fish Merchants are renowned for producing the best Scottish peat smoked salmon, smoked Mallaig kippers and shellfish using traditional kilns with no resort to dyes. 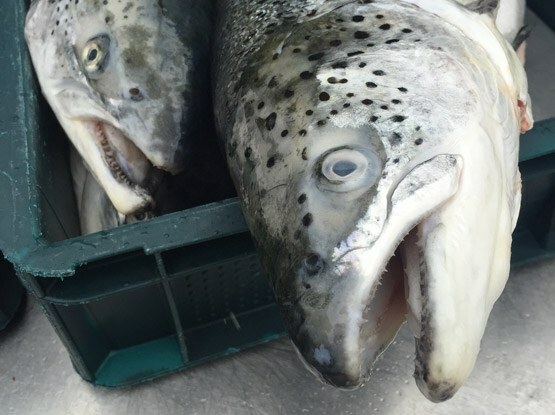 They also supply The Three Chimneys with the freshest and most delicious hake, mackerel, monkfish, salmon and sea trout as well as other seafoods when available. 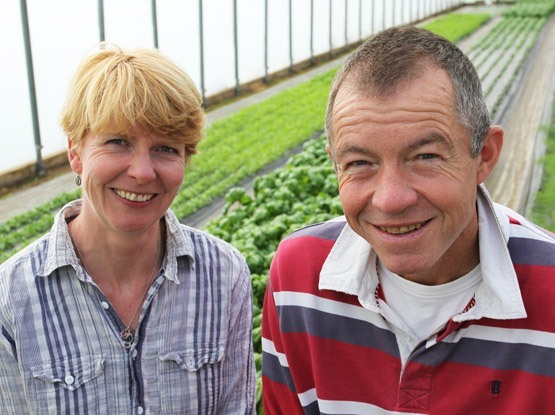 Roger and Fiona Whiddon, two career horticulturists, met in the Algarve in Portugal when they were growing the highest quality watercress for the British market. 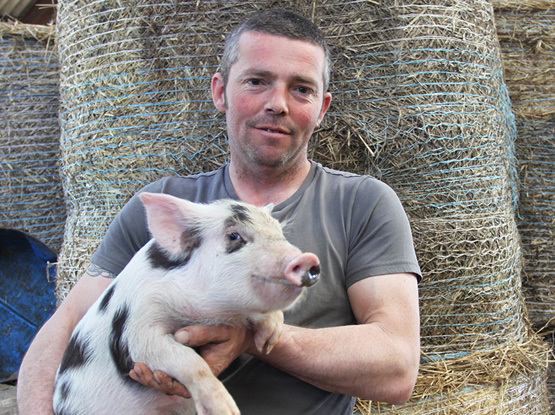 However their ambition was always to grow for a local market and setting up their farm in Orbost on Skye was the way to achieve this. Now they are picking and delivering the finest basil, chervil, chives, coriander, dill, fennel, parsley, tarragon, rosemary and mint to The Three Chimneys on the same day. Four friends set up the Isle of Skye Sea Salt Company in 2011 with the aim of producing a high quality, gourmet sea salt, with minimum impact on the beautiful environment of the island. 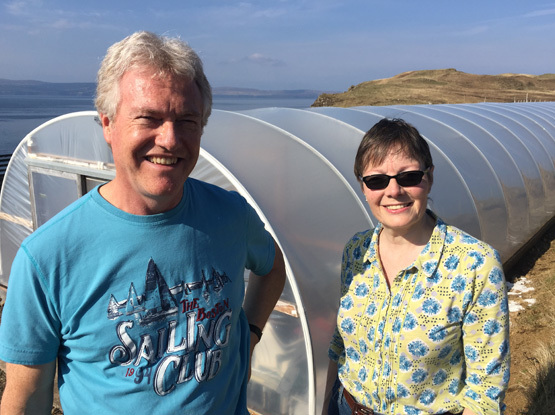 Directors, Chris Watts and Nanette Muir decided to use a solar evaporation method utilising ponds within polytunnels which deliver about 80kg of product from each harvest. Commercial salt production focuses on the high volume production of sodium chloride, but in Skye Sea Salt there are at least 60 other trace and mineral elements that contribute to its very special taste. This special product has recently been accepted to the SlowFood Arc of Taste. Peter Macaskill was encouraged to diversify his activities as a Sleat crofter and attempt cultivating rope grown mussels in the waters of Loch Eishort. He was sceptical at first because this has never been tried before in the Highlands, but he was encouraged by the young spat growth in his first season and soon came to realize the many advantages of growing mussels on long lines at sea instead of harvesting them on the shore. 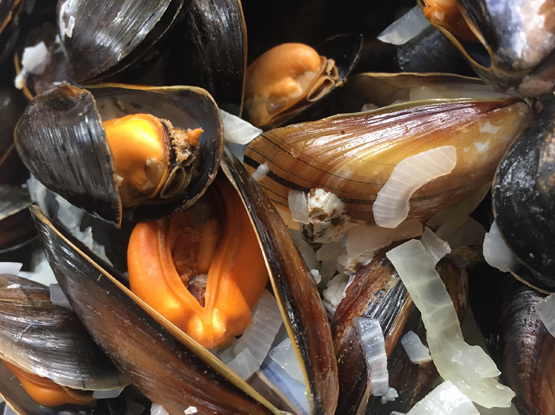 No longer subject to the ebb and flow of the tides, the mussels are feeding twenty four hours a day, are protected from most predators and develop a much fuller and flavoursome flesh.